The AES-IP-38 (EIP-38) is IP for accelerating the AES symmetric cipher algorithm supporting GCM or XTS modes at extreme speeds up to 100Gbps+ @850MHz. Designed for fast integration, fast key switching and high performance, the AES-IP-38 accelerator provides a reliable and cost-effective embedded IP solution that is easy to integrate into high speed crypto pipelines. The IP supports Cipher Text Stealing (CTS) in combination with AES-XTS. 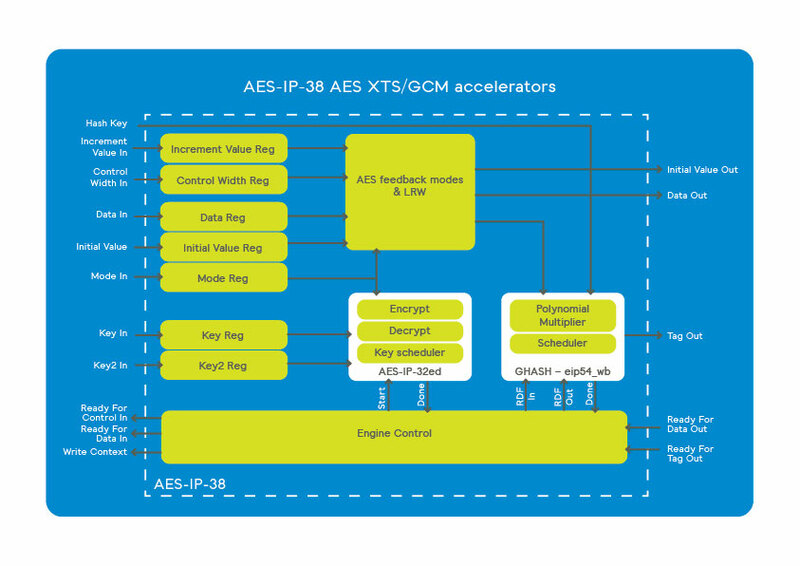 AES XTS/GCM family of high speed accelerators. Available in 12 configurations / performance grades. Full key and data path integrity option. The AES-IP-38 is a family of the cryptographic library elements in Inside Secure’s HW IP library. For example, the AES-IP-38 is the cipher core embedded in all MACSec protocol aware security engines. The accelerators include I/O registers, encryption and decryption cores, and the logic for feedback modes and key scheduling. Even though the Advanced Encryption Standard (AES) algorithm was designed to allow high-speed implementations, its regular feedback modes such as CBC, CFB, and OFB are not ideal for supporting very high-speed networking applications. The AES-GCM and AES-XTS algorithms do not use these regular AES feedback modes and allow very high-speed encryption and authentication by enabling an implementation to make use of parallelism. Typical uses cases for AES-GCM and AES-XTS are high-speed transmission (virtual private networking) and disk storage (protection of data at rest). For transmission protection, AES-GCM can for instance implement authenticated encryption at the network layer (IPsec) or at the data link layer (IEEE 802.1ae). The AES-GCM (Galois Counter Mode) has, since its publication in 2005, been used in many IPsec and MACsec applications. It is a very efficient algorithm, suitable to achieve very high performances. AES-XTS has been adopted by IEEE P1619 for protection of data at rest. The AES-IP-38 also supports the legacy AES-LRW algorithm. Within the AES-IP-38 product family a range of AES-XTS configurations is available that allows efficient key switching while maintaining throughputs for small sector sizes, ex- and including CTS. Sustained performance for any object sizes ranges from 6Gbps to 100Gbps+ depending on the configuration and area. Gate count is between 90K and 650k gates depending on the configuration. Multiple AES-IP-38 cores can be cascaded. Specifically for storage solutions a dedicated configuration, offering full key and data path integrity, is available. Fast and easy to integrate into SoCs. The AES-IP-38 accelerators are available in different configurations, suitable for different applications, and for meeting different gate count and throughput objectives. The AES-IP-38 is available in configurations supporting all modes, and dedicated XTS (and ECB) only configurations (EIP-38x-*), which are optimized for XTS operations having very limited overhead switching keys and direction. For the non-high speed cores (AES-IP-38b, AES-IP-38b-gcm, and AES-IP-38x-1) an outer layer is available. This outer layer has a 32- bit wide register interface. The input and output buffer registers Inside Secure the Shell allow for pipelining - input data and context information can be written and output data can be read while the Engine is performing an AES/GCM/XTS operation at the same time. This way, maximum through put is achieved using a 32-bit register interface. The lower speed cores provide customers with the flexibility to be used with or without the Shell. The high- speed cores (AES-IP-38f, AES-IP-38o, AES-IP-38x-IP-5, AES-IP-38x-8, AES-IP-38x-10 and AES-IP-38x-14) must be integrated without the Shell to achieve the optimal performance. Customers can also use the Shell logic as a basis for building a customized, width- constrained interface. On request, the AES-XTS only configurations are available with Data Integrity protection of the data path. All key and data inputs and outputs are extended with a parity bit per byte. The internal data path is extended to protect these vectors against single bit faults. Basic AES encrypt and decrypt operations. Key sizes: 128, 192 and 256 bits. Key scheduling in hardware, allowing key, key size and direction changes every 13/15/17 clocks with zero impact on throughput. Hardware reverse (decrypt) key generation. Non-feedback modes: ECB and CTR. Feedback modes: CBC, OFB (128 bit), CFB (1-, 8- and 128-bit). AES-GCM (using AES-CTR mode and GHASH). Basic GHASH operation (selecting no encryption). (Multiple) High-speed versions (encrypt only, en-/decrypt and XTS only). XTS only configurations embed a dedicated CTS AES core allowing CTS to be applied every 10/12/14 clocks with zero impact on throughput.